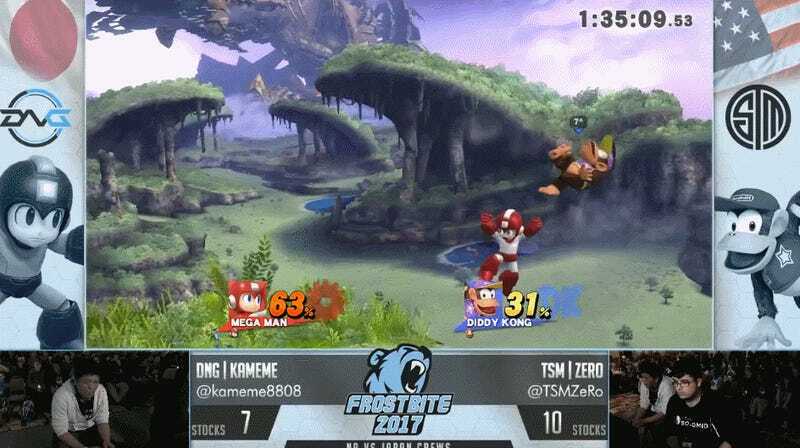 America’s team in the Smash Bros. Wii U Crew Battle at Frostbite 2017 had a big lead going into the second half and things looked to be coming up roses until Japan replied with a slew of brutal matches that left many of the game’s top pros bruised and bloodied. It all began with Kirihara who managed to bring an end to Eric “Mr. E” Webber’s extended run, dispatch Dabuz with ease, and put Diddy Kong master ZeRo on notice. Crew Battles are run like relay marathons in which fighters stick around until all of their lives are used up at which point they’re replaced by the next player in the team’s stack. Japan had been slowly losing ground to the Americans, but Takuto “Kameme” Ono helped stop the bleeding, and was followed up by Kameme who managed to put ZeRo, currently the game’s undisputed top player, down with some particularly dazzling Mega Man combos. Fighting down to the wire, the inflection point in the scoreline didn’t actually come until Japan’s final player, Rei “Komorikiri” Furukawa, was able to demolish the American’s last hope, Nairoby “Nairo” Quesada. The former cut through the latter convincingly,with the beat-down thorough enough it led many to complain, including a fellow teammate, that Nairo had “disrespected”his Japanese opponents by playing Bowser instead of one of his other,supposedly more versatile and adaptable fighters. 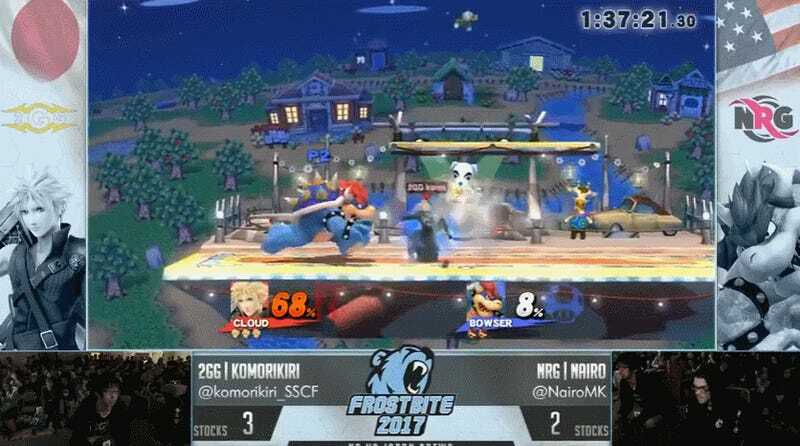 In a short video clip on Twitter, however, Nairo put a stop to the complaints and trash talking by having Komorikiri confirm that the Japanese team believed he would pick Bowser all along and had been preparing for that inevitability. The result was unexpected given some of the heavy-hitters on the American side, especially once Japan appeared to folk early on. But given some of the more tenacious performances of players like Kameme and Komorikiri at other recent tournaments, it wasn’t unimaginable. You can watch the Crew Battle’s entire run below.